How can you command attention with so many colorful images around the world? 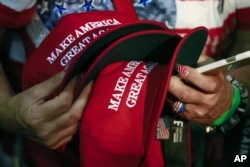 Some activists have learned that they can gain popularity by connecting their movements to a color like yellow, red, blue or green. This month, French demonstrators wore "yellow vests" to block highways from Provence to Normandy. They rioted in Paris and left French President Emmanuel Macron struggling to meet their demands. Why do they wear yellow vests? 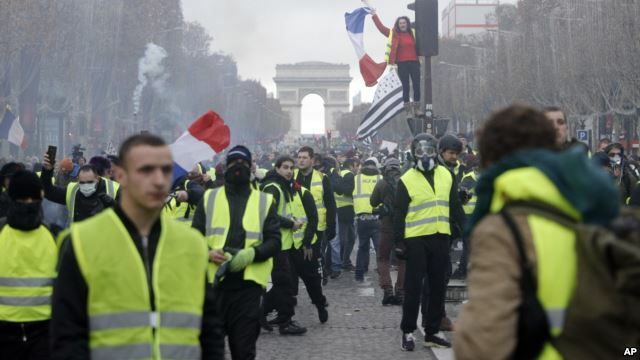 All French drivers must carry a yellow vest in their cars in case they have car trouble. The drivers launched their protest against a proposed increase in fuel taxes wearing the vests. To the protesters, the vests represent a troublesome government demand. So they used the vests to express their anger over high taxes and other financial difficulties. The vests can be seen easily at night and at roadblocks around France. But they also made protesters easy targets for police during the riots. 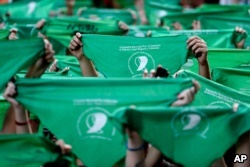 Across the Atlantic, demonstrators wore green handkerchiefs in the streets of some Argentine cities last August. They were calling for women to have the right to end their pregnancies as they choose. The protests in the homeland of Pope Francis started as lawmakers in the Senate voted against a bill that would have permitted abortion in the first 14 weeks of pregnancy. If approved, the bill would have made Argentina only the fourth Latin American country to legalize abortion, after Cuba, Uruguay and Guyana. Women's groups across Latin America have said they will keep fighting for a right to abortion. In 2014, the yellow color was connected with pro-democracy protests in Hong Kong. 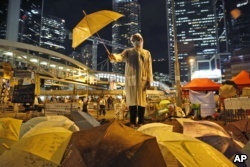 They became known as the Umbrella Movement. The protesters used umbrellas as protection from pepper spray and tear gas. They wore yellow pieces of cloth and hung a yellow banner overlooking the city from Lion Rock to demand full voting rights. The yellow color was borrowed from another of Asia's pro-democracy protests in the 1980s. At that time, Filipinos wore yellow in an effort to drive out the country's dictator Ferdinand Marcos. FILE - In this June 15, 2009, file photo, a demonstrator wears a green mask as hundreds of thousands of supporters of leading opposition presidential candidate Mir-Hossein Mousavi turn out to protest the result of the election in Azadi (Freedom) square. In Iran, supporters of reformer Mir-Hossein Mousavi wore green to support his campaign against then President Mahmoud Ahmadinejad and the country's clergy in 2009. Green is a good color in Islamic tradition. 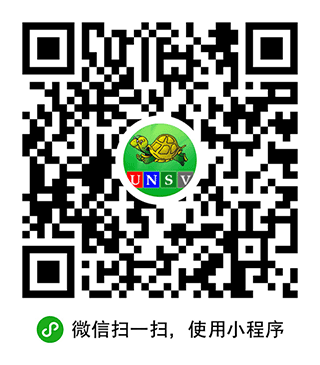 Some link it to nature. Iranian poet Eqbal Mansourian told a crowd at a demonstration, "Make our lives green again, make it rain again, make us hope again." Security forces finally crushed the demonstrations. The violence ended with at least 80 people killed and 2,500 arrested. Many others were tortured in prison. FILE - In this Sept. 24, 2007, file photo, Buddhist monks march on a street to protest the military government in Yangon, Myanmar. The protest was known as the Saffron Revolution. 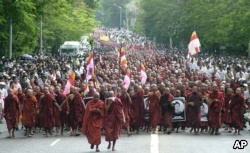 Buddhist clergy led protests against Myanmar's military government in 2007. The dark brown color of their clothes gave the movement its name, the Saffron Revolution. The protests started as the government raised fuel prices. They soon turned into a call for democracy. The Buddhist monks even visited the home of opposition leader Aung San Suu Kyi who was under house arrest at the time. On September 24, over 100,000 Buddhist monks marched in Rangoon as demonstrations took place throughout Myanmar, also known as Burma. The military's violent response led to worldwide condemnation. Under international pressure, the military slowly approved a new constitution and held democratic elections. In 2015, Aung San Suu Kyi's opposition party won the majority of seats in national elections to take control of the government. In neighboring Thailand, activists wore red shirts or yellow shirts to signal which of two opposing political groups they supported. Yellow is the color connected with the late King Bhumibol Adulyadej of Thailand. 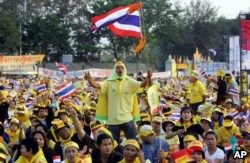 On the 60th anniversary of the king's rule, opponents of former Prime Minister Thaksin Shinawatra wore yellow calling for his removal from office. In September 2006, Thailand's military ousted Thaksin from office saying he had abused his power. 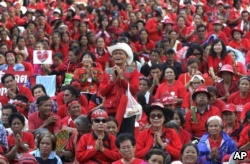 Thaksin's supporters reacted by wearing red shirts. In Thailand, red is one of the colors of the national flag representing the nation. The other colors are white for religion and blue for the monarchy. FILE - Orange was the campaign color of Ukraine's pro-Western presidential candidate Yushchenko in the 2004 presidential election. Orange was the campaign color of Ukraine's pro-Western presidential candidate Viktor Yushchenko in 2004. His supporters protested the victory of his pro-Russia opponent and took to the streets in what was called the Orange Revolution. After huge street demonstrations, officials ordered a new election that Yushchenko won. Russia blamed Western countries for supporting the protests. Political disputes ended Yushchenko's presidency in 2010 and led to the ongoing conflict between Ukraine and Russia. 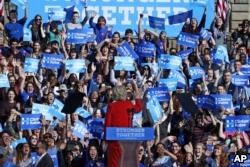 The words "blue states" and "red states" gained new attention during the disputed 2000 U.S. presidential election. American television networks used the colors of red and blue from the U.S. flag to identify the states voting for Texas Governor George W. Bush or Vice President Al Gore. The color red came to represent Republicans and blue, Democrats. The division between "red states" and "blue states" has expanded to clothing. Politicians and supporters from the two parties often avoid wearing colors connected to their opponents. I'm Mario Ritter. I'm Caty Weaver. Hai Do adapted this AP story for VOA Learning English. Mario Ritter Jr. was the editor.